In this post, the 3rd in the VLOOKUP Hacks series, we’ll dig even deeper into the 4th argument. We’ll see how we can leverage it to help with our reconciliations and other list comparisons. Let’s pretend for a moment that we need to compare two lists. We’d like to find out which items in one list appear in the other list. This type of thing is often referred to as a list comparison. Accountants often refer to this task as a reconciliation. So, let’s use VLOOKUP to complete one of the most common reconciliations of all, a bank rec. I’ve prepared a video demonstration as well as the detailed steps below for reference. Now, we have a simple question. Which checks in the check register have cleared the bank? That is, which checks on the check register are also found in the bank activity table. When a check is found in the bank activity table, we want to return the amount. This sounds like a job for VLOOKUP. Specifically, we get an amount for every check, even those that haven’t cleared the bank! 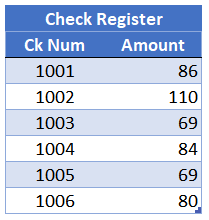 For example, checks 1003 and 1005 are not in the bank table, but, the formula retrieves a value for them. So, what are we supposed to do? Do the bank rec manually? No! This brings us to our next hack. In the formula above, the 4th argument is omitted, so, it is performing a range lookup. We discussed this in detail in the previous post. When VLOOKUP performs a range lookup, it is not looking for an exact matching value. Instead, it is looking for a value that falls between a range of values. For example, 1003 returns 110 from the bank activity table because 1003 is >=1002 and <1004. Upon reflection, this is exactly what we would expect after understanding range lookups from the previous post. Now, here’s the hack that will help. 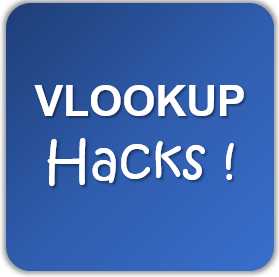 Hack: when the 4th argument is FALSE, VLOOKUP returns #N/A when no matching value is found! Yes … it worked! The update is shown below. Now, we can easily see which checks have cleared the bank (those where the amount per bank is returned), and which are still outstanding (#N/A). So, we are good, right? Well, not so fast. You see, the #N/A error will trickle down to mess up any formulas that include the range. For example, perhaps we want to compute a total, as shown below. So, is there a way to clean up the #N/A errors, so that the reconciliation will look cleaner and so that the total formula won’t be broken? Yes…we can get a little help from the IFERROR function. In summary, IFERROR will return its first argument, unless it is an error. If so, it will return the second argument instead. Now it is very clear which checks are still outstanding, and the total works! Wow, that tiny little 4th argument has a big impact on how the VLOOKUP function behaves, and, opens up many interesting way we can apply it to our work. First, thanks for all the tricks…is very interesting and helpful. I wish to k now, please, in this Vlookup formula , VLOOKUP([Ck Num],Table1,2), how you put the [@Ck Num] instead of D7 like in your exemple? is very useful but i don’t know how to do it. This reference is automatically used by Excel when you select the cell inside the Table (Insert > Table), but, you can type it in as well. Please note this works when you have used the Insert > Table command to insert a table, and not when you are storing your data in an ordinary range…thanks! This is good – for checks with ck #’s. Looking for any ideas for matching all bank transactions dumped into cvs/excel to all book transactions (they don’t necessarily have same descriptions or reference #s). Would like quick way using excel or some other software to compare transactions to do bank rec when have a lot of transactions per month (approx. 250+ items per mo. on bank statement). Thought maybe power query but have not used other than seeing it in a course I took from your co. or might have to try to use quick books ?!? (i.e.import info into quick books). GL the company uses is a home grown program for specific industry that doesn’t have automated bank rec module.